Bistro kicks its shoes off at home. Rachael cooks up Croque monsieur style monte cristo croutons; frisee salad and shallot vinaigrette plus her mom's favorite cocktail. 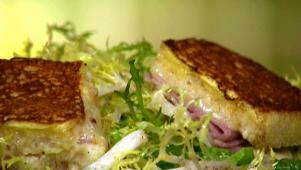 Monte Cristo croutons are big stuffed croutons served atop frisee salad. Rachael makes her mom's favorite bistro cocktail, a French 75.